This is a reminder that tomorrow is the opening of the exhibition Vivienne Westwood, 1980-89 which was organized and curated by the graduate students of our program. To read more about it, click here. 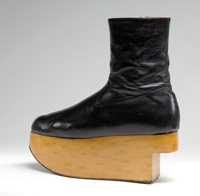 Vivienne Westwood, “Rocking Horse” boots, leather and wood, 1987, England, Gift of Francisco Melendez A.K.A. Francois. The Museum at FIT. This entry was posted in Exhibition and tagged MFIT, Vivienne Westwood. Bookmark the permalink.